There is a new rating system which matches job positions which are open to seekers of the job. Since August 28th the employers who hire under Temporary Foreign Worker Program are required to use this freshly introduced system. Through this, they can invite potential professionals who meet certain compatibility criteria with the job that is posted and apply for the advertised position. The Canadian government has named this as a Job-Match, and employers can access the service easily in the Canada Job Bank through their personal dashboard. The introduction of this feature will impact high as well as low-wage applications figuring in the Labour Market Impact Assessment. Employers who intend to hire through this Program are required to obtain a positive Impact Assessment data prior to the hiring of a foreign worker. When the Labour Market Impact Assessment has been issued it provides a proof that Canadian citizens or PR's were not ready, or willing, to perform these jobs. Labour Market Impact Assessment is not required for all foreign workers and all hiring of foreign workers is not conducted through the Field Worker Program. Other LMIA-exempt hiring details are managed in the International Mobility Program, which is a sufficiently broad categorization having such initiatives as the Intra- Company Transfer Program, the International Experience Canada Program, and NAFTA recruitments. LMIA has a few norms for advertising which the employers are required to follow before applying for a Labour Market Impact Assessment. From August 28th, employers, of all provinces and territories must advertise on Job Bank and go for two more methods to recruit. These must be compatible with the occupation listed. There are high as well as low-wage positions which vary depending on the classification of the position. A few Jobs where the employee is paid less than the provincial median wage for the said occupation are considered as low-wage jobs. Those paid at/ or above the median wage are high-wage jobs. Employers going for hire for high-wage must invite all job aspirants to be matched in the first 30 days from when the job advertisement was given on Job Bank. They can apply for the post when they have a four-star rating. Employers going for hire for low -wage profile must invite all job aspirants to be matched in the first 30 days from when the job advertisement was given on Job Bank. They can apply for the post when they have a two-star rating. 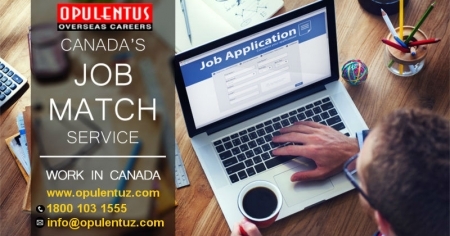 There is a video to explain the working of Job Match mechanism from the government of Canada. A green button is visible for job postings for which potential aspirants of anonymous nature can be matched. The profiles of Job seeker are ranked as per their best-matching. With a click, profiles marking an Invitation to apply can be set. An activity report is generated to mark the job postings, showing the profiles views and invitations sent. If you intend hiring through Temporary Foreign Worker Program (TFWP), please write to us at [email protected] (or) call us on 1800 103 1555. An expert is present to give a free consultation. In case you receive a Canadian job offer and want to submit an inquiry about obtaining a work permit and work legally in Canada, please complete the form provided.